How to Add Drop Down Menu in Blogger Blog or Website? Hello Friends, Today I am very excited to share very important tips for blogger blog or website. Actually, I am going to share how to add drop down menu without any install any new template. We can add it by a simple widget as you add others widget in blogger. So it's very simple and clear coding. I think you are fed up to get some boring and long coding to add it. Somebody suggests you install another drop down menu template. But here I am telling you here, that you can customize your simple blogger template in drop-down menu and can enjoy this facility. So let's start how to do it. First off all create a map your URL and title which you want to list in the menu. I mean decide which post you want to add your wishing list. Suppose you have four main menus, Home, About Company, Services, and plans. you can keep your wishing URL list in About Company, or Services, whatever your requirement. Here I am giving you Primary Sample - Just Edit your URL and Text which you want to add in Drop down menu. 1. Don't delete any things in red text as I mention Above. 3. Now You can Edit you Next Category and Sub Category as your requirement. 4. Take care of <li> and <Ul> Tag. if any list wrong then it will not work. so Edit your Menu list very carefully. You can Add Extra Categories and Subcategories. If you are Confused then see the other Example, where you can see the live demo. www.excelentcontent.com. Now I think you are very clear. 5. And Paste your all mapping Code in the text Area and save it. Note: here One very important thing Add this Gadget Below Heading section I mean replace it with Page Gadget. See in the Screen short. 6. Save or arrange the Gadget. and see the website. then you see the adding menus scattering here and there. so you have to do one step more to arrange it in Order. 7. Go to your Template Menu and Click on Customize Button. 10 After Click the Add CSS you see her blank box. 13. Here you see the life with your Drop Down Menu. Enjoy it. Note: - Sometimes you can see some extra long menu bar. So you can give your Template width See above red Code. I think you have done all and Successfully Add Dropdown Menu in your simple Template. Note: If you want to add more link in future then simply edit Dropdown Menu and add your URL. 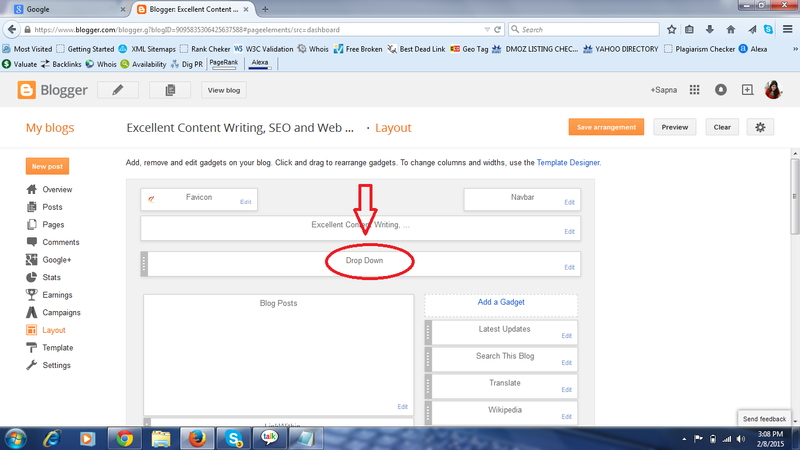 Labels: How to Add Drop Down Menu in Blogger Blog or Website?